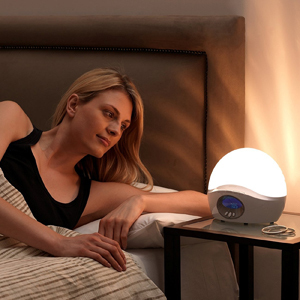 Is The Adjustable Nature Of The Lumie Bodyclock ACTIVE 250 Wake-Up Light Beneficial? 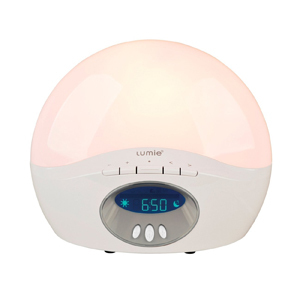 The Lumie Bodyclock ACTIVE 250 Wake-Up Light Alarm Clock with Extra Audio Options is simply designed to improve mood and energy levels and is a certified class 1 medical device. It is a basic room lamp with some buttons and a LED display with the time, and should fit nicely onto most bedside tables which becoming obtrusive. It gives users the choice of a session between 15 and 90 minutes in sunrise and sunset options. It also works as a night light, bedside light and security light. There are also audio settings with FM radio, an alarm, dawn chorus, rooster call, waves and white noise. What benefits have people enjoyed when using this Lumie Bodyclock Light? The first benefit of this device is one that has been mentioned a lot on sales pages and in user reviews. That is the use of the gradually brightening light. This really does seem to be gradual too. There is a nice soft feel to the lamp that makes it more natural and users are not rudely awoken. The same happens with the sunset mode at night. In addition to this, the Lumie Bodyclock wake-up light will go dark enough at night not to be an annoyance, but the time can still be read. Buyers also appreciate the range of audio sounds. These audio options can be turned off if they get too annoying. The bird call is a little grating for some, but here are alternatives a least. Some say that all the options are poor quality in a world of MP3 files and modern sound recording. The quality of the light and the function of the device has a lot to do with the adjustable settings. This is important for anyone that is dealing with a medical condition as the device can be set up for the severity of the condition and personal preferences. The security light function is an odd one that some users may not expect. Some appreciate the random lighting when out for the night. Others found it annoying when the setting is came on without them realising. This is clearly enough of an issue for the company to add a specific warning in the product description. What are the potential problems in choosing this Lumie Bodyclock ACTIVE 250 Wake-Up Light? The sound issues are small personal preferences that most users can easily get around due to the customisable nature of the product. However, there are some additional problems that buyers have experienced that could be a little more problematic. The first is the fact that there is no battery option, this light is only mains powered. This is a concern for all those that want to use this sunrise simulator device daily as a medical solution. A blackout could mean that users don’t get the help they need the following morning. There are also some minor comments about the product being made from a cheap plastic. The more common issue here seems to come from the manual. Once buyers have learnt how to operate this device, all the features become beneficial and the true potential is reached. Unfortunately, some users have problems understanding the manual and how to change some of the settings, this has lead to people confusing the light and sounds settings and losing time when setting their alarm each day. An internal memory for pre-set weekly cycles would be helpful here. Summary: how does this feedback affect the final verdict on this Lumie Bodyclock ACTIVE 250? The important thing to take away here is that it works. There are lots of people giving this model a five star review because it does the job they asked of it. Any other feature or benefit is a bonus. Many feel that they have more energy in the morning, they can get up easier and their mood is improved. It cant cure SAD but it is definitely making it a lot more manageable for a number of users. Many are happy to use this throughout the dark winter months to regain some positivity and productivity. This all comes down to that factor of adjustability. A basic light box has its benefits but doesn’t suit everyone. 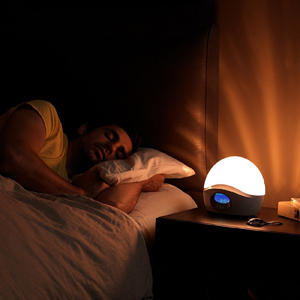 This customisable wake-up lamp has so many settings and options that users can fine tune it nicely. Some will enjoy the brightness and the sounds, others with dim it and take the sounds out. There is a broad appeal here in a simple, relatively user-friendly option and that is why the Lumie wake-up light is so recommendable. Find more reviews about the Lumie Bodyclock ACTIVE 250 Wake-Up Light Alarm Clock with Extra Audio Options on Amazon here.